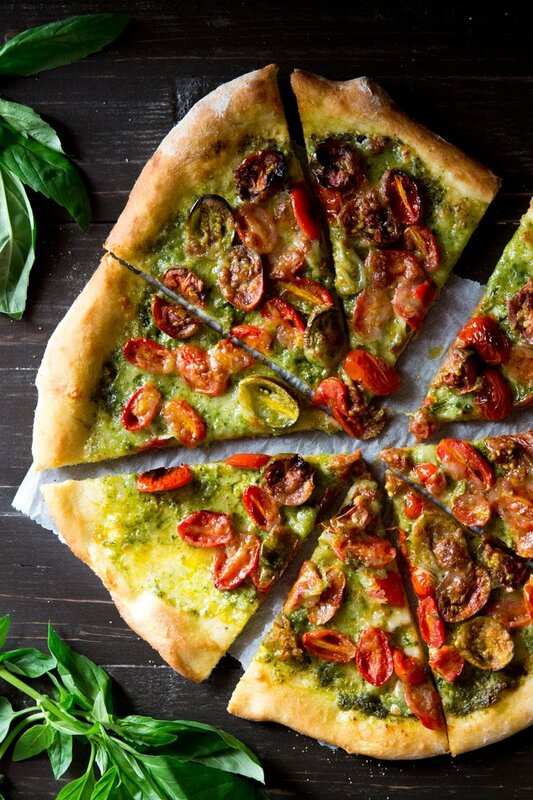 Basil pesto pizza with mozzarella cheese and roasted cherry tomatoes. Using the best homemade pesto recipe and easy homemade pizza dough it’s time to make pizza night even more exciting! Pizza and pesto, need I say more? There was a reason I posted a recipe for the best homemade pesto this week and it was so you could make this insanely delicious pizza! 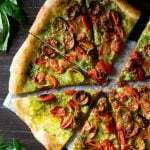 I use my usual basic pizza dough recipe which is so easy, spread it thick with basil pesto and top it with roasted cherry tomatoes and mozzarella. Oh yes, this is basil pesto pizza heaven! Let’s take a moment to drool at that cheesy pizza goodness for a second….I mean c’mon how good does that look!? Pressed for time? Why not try my instant pizza dough recipe. It has no rising time and uses no yeast, perfect for those pizza emergencies! Swapping the usual tomato sauce for homemade basil pesto is the perfect way to make pizza night a little different. I’m always searching for yummy pizza (quite literally) and when I decided to use basil pesto, spread it on the base and then top it with roasted cherry tomatoes and mozzarella I literally left and went to pizza heaven. The thing is it’s so simple and it’s a great veggie option. When I make my own pizza for a Friday night I usually go for 2 or 3 different toppings so there’s a bit of variety. My chicken pesto ciabatta is another great recipe using pesto that you’ve got to try, it’s perfect for weekends! Making the dough is very simple and the more you do it the more natural it becomes. First, add the yeast to the lukewarm water and let it sit for 5 minutes. Shape the dough into a nice round ball and place in a lightly oiled clean bowl. Cover with cling film and sit the dough in a dry warm place for 2-3 hours or until doubled in size. Once the dough has risen, knock the air out by pressing down on it with your fist. Wash and dry the cherry tomatoes then cut them in half. Toss them in 1 tbsp of olive oil then lay them out on a large lined baking tray then sprinkle them with salt. Roast them in a hot oven for around 15 minutes until soft (see photo below). Take one half of the dough and roll it out either in a rectangle or circle to fit your largest baking tray. Spread a generous amount of basil pesto all over the base then top with some roasted cherry tomatoes and finally mozzarella. Repeat this with the second half of dough then bake them in a very hot oven for around 8-10 minutes. Pour yourself a glass of red wine and select your movie. Yass for pizza night! 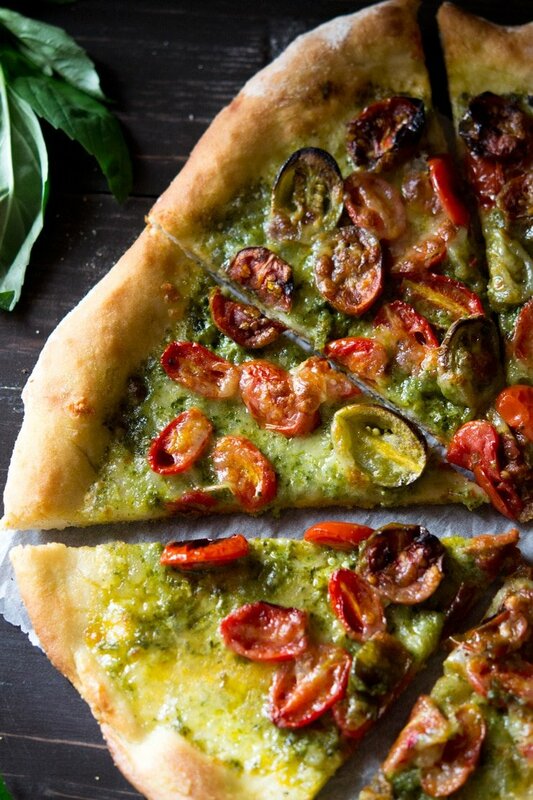 Basil pesto pizza with mozzarella cheese and roasted cherry tomatoes. Using the best homemade pesto recipe and easy homemade pizza dough it's time to make pizza night even more exciting! Add the yeast to the lukewarm water with 1/2 tsp sugar for 5 minutes. Combine the flour and salt in a large mixing bowl. 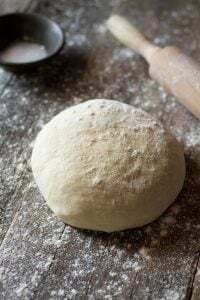 Make a well in the centre and add the yeast and water and start to mix it together with a metal spoon then add the olive oil and mix together until a rough dough forms. If it's too sticky you can gradually add a little more flour. Dust a clean work surface with a little flour and knead the dough for around 5-10 minutes until it's silky smooth and soft. If you lightly press your finger on the ball of dough it should spring back up easily. Add 1 tbsp of olive oil to a large clean bowl and rub all over until the bowl is coated. Shape the dough into a ball and place in the bowl, rub the top of the dough with a tiny amount of olive oil. Cover with cling film and leave in a warm place for at least 2-3 hours or until doubled in size. Preheat the oven to 180°C/400F/gas mark 5. Wash and dry the cherry tomatoes then cut them in half. Toss them in 1 tbsp of olive oil then lay them out on a large lined baking tray then sprinkle them with salt. Roast them in the oven for around 15 minutes until soft. Divide your dough in half roughly with your hands and place on a lightly floured work surface. 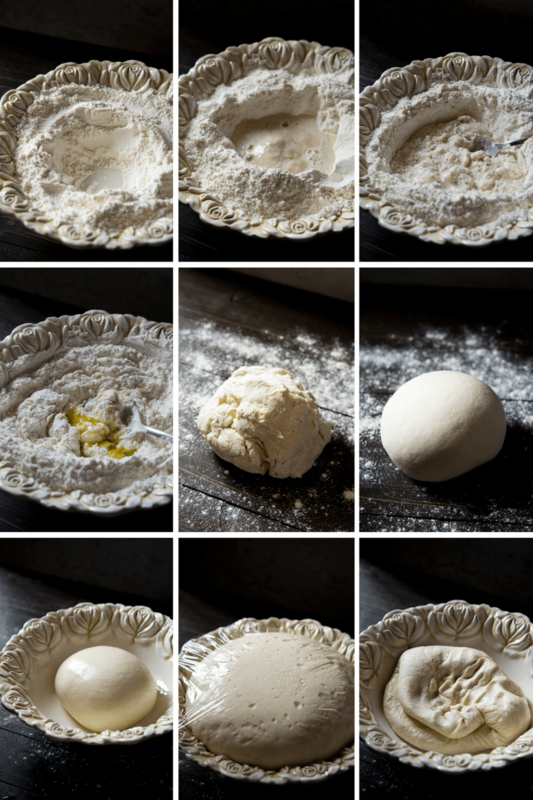 Press lightly in the dough to shape it into a rough circle or rectangle then using a rolling pin dusted with flour roll the dough out to fit your tray. Dust the tray with 1 tbsp of semolina flour or polenta then place the pizza bases on top. 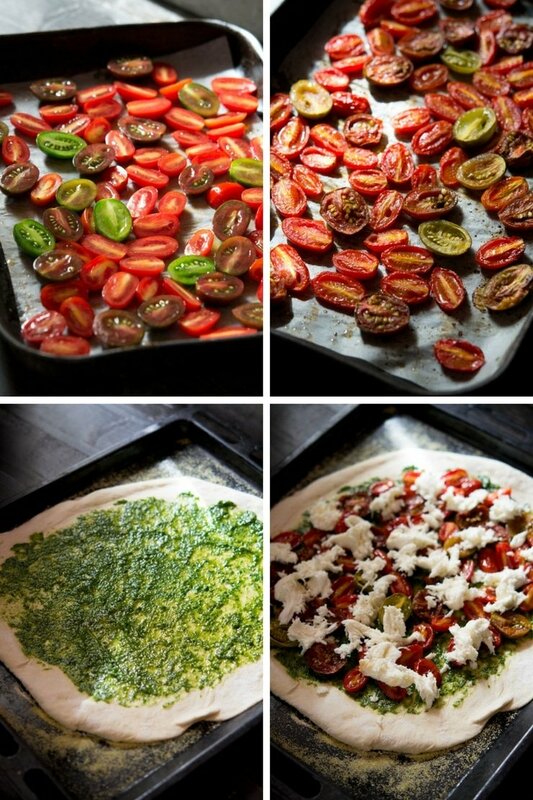 Spread 3 heaped tbsp of homemade pesto on each pizza base, top with roasted cherry tomatoes and then torn mozzarella. Bake the pizzas in the oven for 8-10 minutes until the crust is golden and cheese melted. Type 0 flour can be substituted for type 00 or all-purpose. I’ve been craving pizza for weeks but didn’t want to grab takeout…this recipe is everything! Perfect to satisfy my craving, looks absolutely delicious and simple enough to make! Can’t wait!! I am obsessed with making pesto so this is the perfect pizza for me! Who needs tomato sauce anyway? And I looove your step by step photos – so helpful! This pizza looks heavenly! It reminds me of when I went to Italy 😍 That dough is so easy to make I will have to give it a try.